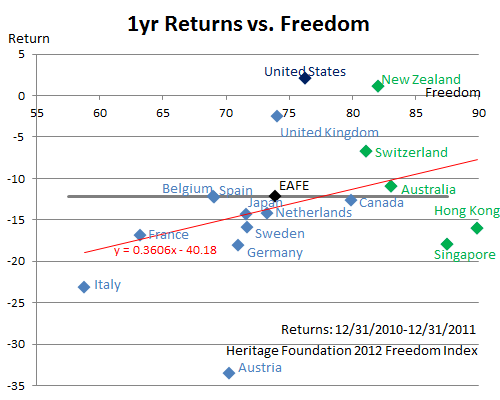 I’ve been discussing foreign freedom investing for a decade now. In the spring of 2010, I used the term “Ring-of-Fire” to describe countries with a high debt and deficit and suggested avoiding them. A year later, I revisited that advice and counseled investors to continue tilting toward specific countries. 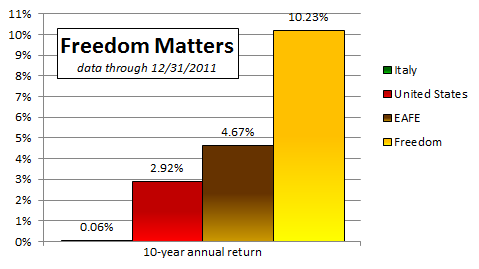 Now at year end, I will review how freedom investing fared in 2011 and in the decade since 2002. This year’s changes were discouraging. Paul A. Gigot, the Wall Street Journal editorial page editor, wrote in the foreword to this year’s report, “The financial panic and Great Recession have sent the march of freedom in reverse, and the policy responses to both events have done little to arrest the retreat.” If all that Keynesian spending really did any good, you would expect countries that increased government spending to have better returns as a result. But they did not. The nations in my analysis included 16 different developed countries representing 85% of the world’s investable markets and 98% of the developed countries. Freedom scores ranged from #1 in freedom Hong Kong at 89.9 to #92 ranked mostly unfree Italy at 58.8. This correlation is not accidental. As Italy’s government spending has increased, so has its corruption. Big government is not the answer to corruption. It is largely the cause. And excessive government spending does not encourage the private sector. It competes with the private sector. 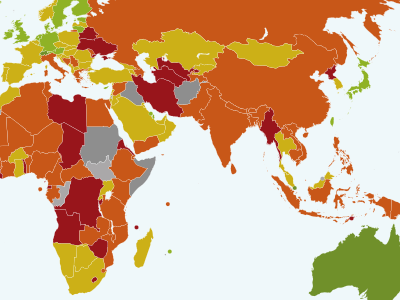 A country’s economic freedom score is based on 50 measurements. They fall under these 10 categories: property rights, freedom from corruption, fiscal freedom, government spending, business freedom, labor freedom, monetary freedom, trade freedom, investment freedom and financial freedom. Subscribe to Marotta On Money and receive free access to the 1.5 hour video: Where in the World Should I Invest?